The JGB collapse has been delayed yet again. The Bank of Japan (BoJ) has introduced a Negative Interest Rate Policy (NIRP), via a complicated 3-tier policy rate, with one of those rates at -0.10%. Once again, year-end forecasts of higher bond yields have been met with an early bond bull market. The effect on the real economy of marginally lower interest rates is negligible. The only way this announcement will matter is if it helps weaken the yen. If the Fed followed up its December rate hike with more hikes this year, the divergence in policy rates would most likely help cause the yen to depreciate versus the dollar. However, this step by the BoJ makes the Fed decision to hike look even more comically out of step with global economic developments, which reduces the odds of those future hikes. 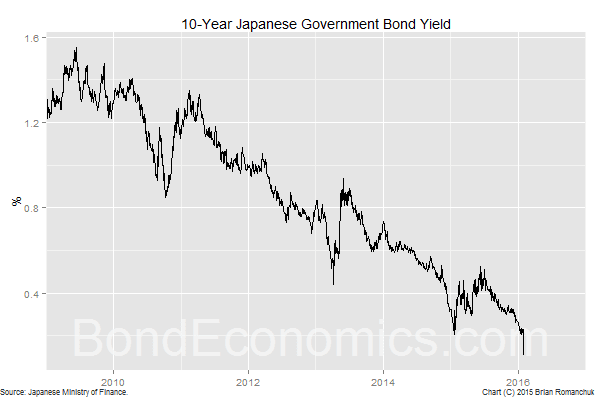 By itself, an interest rate of -0.10% is meaningless; a 10 basis point annual carry loss is less than the daily mark-to-market volatility of foreign currency asset positions for Japanese investors. Negative interest rates will only become significant if they can move below -1%. Otherwise, all that the negative policy rates have accomplished is to replace the "Zero Lower Bound" (ZLB) with an "Almost Zero Lower Bound". This is a theoretical calamity for interest rate option models with logarithmic interest rates, but it is unclear how much it matters elsewhere (other than dropping the floor for "fair value" bond yields slightly). The tentative nature of the Japanese negative rates means that the ZLB has not yet been seriously challenged. Do you know how much the negative tax is likely to be Yen terms and whether it gets distributed back to the fiscal authority? I don't know how Japan's system is set up. I have not looked at the details, but my impression is that the amount of deposits that are covered by negative rates is small, so the fiscal effect is non-existent. I believe that the BoJ is theoretically a private bank with shares listed on the exchange, but the government holds a massive majority. My impression is that the private holders that remain are mainly "aristocratic" families that preserved some holdings when the BoJ was nationalized. The Ministry of Finance has total control over operations, and almost all profits flow through to the MoF.